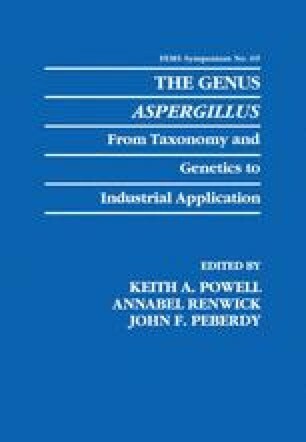 The classical methods for systematic studies of the genus Aspergillus have been very successful and have provided one of the better classifications among fungal genera. However, the genetic basis of a majority of characters used for these studies is not known and as a result the phylogenetic and evolutionary relationships between taxa and even between most sections of the genus are uncertain since it is probable that some characters which carry a high taxonomic significance have only a low significance in phylogenetic and evolutionary terms. This is especially so for anamorphic taxa. Consequently, it is possible to argue that direct comparison of the nucleotide sequence and organisation of nucleic acids is likely to be the most sensitive discriminator between individuals and is most likely to indicate clearly their phylogenetic and evolutionary relationships.